Elegant PETER KAISER Black embossed LEATHER low heels size 7 . Condition is excellent, like new, Pre-owned. Shipped with USPS Priority Mail. Betsey Johnson Wedding Unite Ankle Strap Sandals Gold Rhinestone Heels Size 7. Condition is Pre-owned from a clean, non-smoking home. These were worn once and are in excellent condition with the original box. Shipped with USPS Priority Mail. Authentic Oscar de la Renta Womens Size 6.5/37 Condition is Pre-owned and has never worn. Shipped with USPS Priority Mail and Original box is not included. Nine West Hadaclue size 7m. Real cow leather fur. Black patent leather. Nina Formal Sandals Heels 7 M Champagne satiny fabric with jewel detail . Leather soles. Condition is New with defects. Defect is shown in picture number 7, a small spot of discoloration on the fabric of the toe of right shoe. Shipped with USPS Priority Mail. Right shoe, other than that they are in excellent condition. Size: US 7 EU 37. This item is Genuine and authentic. Material: Genuine leather upper. Firm Cushion Foot Bed. Black Leather. Leather Lining. We want you to be happy with our products and we want to insure that you are. The bottom soles has very light dirt and show signs of light wear. Insoles are clean and show no wear. Shoes are in pre-owned condition with light wear. Light scuffing and along the back of the heels and toes. Stiletto Heel 3.5". Color:Black Leather. Rubber Sole. Slip On Style. Open Toe Slingback. DIANE Sz 7 M. Abstract Pattern Brown, Orange, Red, Yellow, Blue, Black. Stiletto Platform Heels. Color: Leopard Brown. Material: Leather. Unless otherwise stated. Condition: New without Box. See Pictures. Size: 7 B / 37. 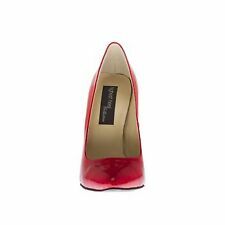 Authentic Louis Vuitton Women's Cherie Pump Shoes Size 37 Beautiful LV Monogram. Excellent condition. Worn 2 times about 3 hrs for each event. Condition is Pre-owned. Shipped with USPS Priority Mail. Beautiful pair of Ralph Lauren's classic stiletto heeled. and soles have very little wear. Made in Italy! Light Marks on bottoms of soles. They have been handled/tried on. Beautiful Shoes for a special occasion.